We briefly review the calculations of quantum corrections related to the exact Novikov-Shifman-Vainshtein-Zakharov (NSVZ) β-function in N=1 supersymmetric theories, paying special attention to the scheme dependence of the results. We explain how the NSVZ relation is obtained for the renormalization group functions defined in terms of the bare coupling constant if a theory is regularized by higher derivatives. 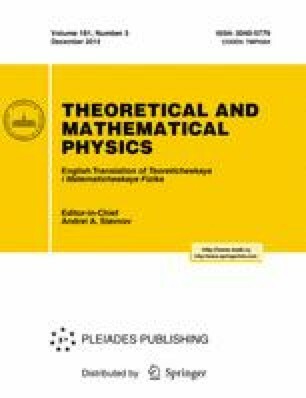 We also describe how to construct a special renormalization prescription that gives the NSVZ relation for the renormalization group functions defined in terms of the renormalized coupling constant exactly in all orders for Abelian supersymmetric theories regularized by higher derivatives and discuss the scheme dependence of the NSVZ β-function (for the renormalization group functions defined in terms of the renormalized coupling constant) in the non-Abelian case. We show that in this case, the NSVZ β-function leads to a certain scheme-independent equality. Prepared from an English manuscript submitted by the authors; for the Russian version, see Teoreticheskaya i Matematicheskaya Fizika, Vol. 181, No. 3, pp. 475–486, December, 2014.